The exhibit is arranged, basically, in chronological order. The information presented in the exhibit checklist includes: basic cataloging information; description of important illustrative elements found within each map; and information on many of the cartographers and mapmakers represented in the exhibit.Many of the maps on display are from the magnificent "James C. and Adina P. Simmons of Tel-Aviv, Israel and Tallahassee, Florida Collection of Antique Maps of the Holy Land" and are so noted, below. 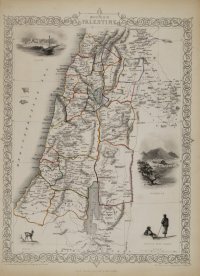 · HelenJane Armstrong, Antique Maps of the Holy Land in the University of Florida Libraries, Featuring The James C. and Adina P. Simmons of Tel-Aviv, Israel and Tallahassee, Florida Collection of Antique Maps of the Holy Land: An Annotated Cartobibliography. [Gainesville, FL]: George A. Smathers Libraries, 1999. · Eran Laor, Maps of the Holy Land. New York: A. R. Liss, 1986. · Kenneth Nebenzahl, Maps of the Holy Land. New York: Abbeville Press, 1986. Items from the Holy Lands Map collection, included in Dr. Armstrong's Cartobibliography, are indicated by the respective Cartobibliography number. Copies of the Armstrong guide are available for purchase through the Bookstore located in the Smathers Library building. This fine work is a must for anyone interested in the cartography of the Holy Land and includes a fine introductory essay, "Of Pilgrims, Peregrinations, and the Landscape of Belief" (by Robert Singerman); an introductory note by Dr. Armstrong; and in-depth descriptive entries of the collection organized by the following categories: "Classical and Early Middle Ages;" "Renaissance: 1450-1569;" "Golden Age of Cartography /Emergence of the Atlas: 1570-1660;" "Ascendance of France and the Later German Revival: 1660-1770;" and "Emergence of England and the Beginning of Topographic Surveys: 1770-1900." 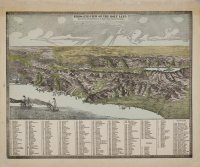 The Cartobibliography also contains illustrations of selected maps, a list of references, and supplemental sources. 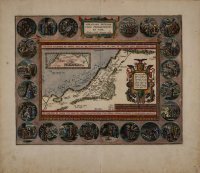 The scaleable map images are provided by Publication of Archival, Library & Museum Materials (PALMM) and are located on their Middle East Map Collection site. Woodcut 20 x 23 cm. An imaginary representation of the Temple "Teplum Saomois" in the midst of walled-in Jerusalem. From Folio XVII of Liber Cronicarum, commonly called the "Nuremberg Chronicle." 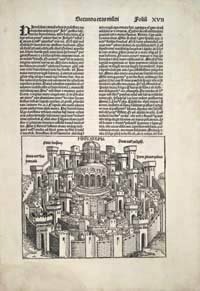 While thought to be an imaginary view, it is probably the first printed representation of Jerusalem. This view was made in 1492. By this time Nuremberg, Germany was a major cultural center and becoming one of the most important publishing centers in Europe. 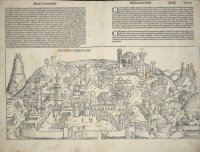 In his woodcut, Schedel (1440-1514) used a new technique of mapping called a bird’s-eye view to present a more accurate impression of the city's character. The bird’s-eye view was a panoramic view simulating the elevated profile of the city from a low angle. It was to become a popular method of showing town plans during the next two centuries. The "Nuremberg Chronicle" was published shortly after Columbus reached the New World. Thus, it is one of the last opportunities to view the medieval world, as the Western Europeans knew it. It is considered the most important illustrated book of the fifteenth century and only the Gutenberg Bible ranks higher as the most important printed book of the period. The illustrations and the maps are cut in wood by Michael Wohlgemut. Woodcut 26 x 54 cm. An imaginary view of the destruction of Jerusalem. Shows the Temple ablaze. From Folio LXIII of Liber Cronicarum, commonly called the "Nuremberg Chronicle." Woodcut 30 x 39 cm. Shows the Eastern Mediterranean and the Middle East from Cyprus to Babylonia. The shoreline of the Holy Land runs from "Ptolemais" (Acco) as far as "Ascalon. "There is a nonexistent bay north of Acco and the same north of Jaffa. On verso Latin text within decorative borders, "Q Varta." Sebastian Munster (1489-1552) was a humanist scholar, astronomer and geographer, and professor of Hebrew at Heidelberg. He relocated to Basel, Switzerland after 1525. He published many works on the history of geography, among them Cosmographia Universalis (1544) and Cosmographia Universalis, vetus et nova complectens Claudi Ptolemaei (1540). Munster's maps became the most influential general and regional maps until the 1570 publication of Ortelius’s Theatrum orbis Terrarum. Hierosolyma, Clarissima totius Orientis ciuitas, Iudaee Metroplis… Hoc tempore Hierosolyma turcis Czumobarech dicitur. Copperplate 33.7 x 48.3 cm. Two plans of Jerusalem on the same sheet. On the left half of the sheet is an imaginary topographic description of the ancient city at the time of Jesus Christ. On the right half of the sheet is found a topographical description of the modern city (i.e., in 1575). Small inset at bottom right: Moses receiving the Tablets of the Law, with Aaron at the right. Hierosolyma urbs sancta. Iudeae, totius que Orientis longe clarissima, qua amplitudine ac magniicentia hoc nostro aevo conspicua est. Copperplate 32.7 x 41.3 cm. Jerusalem "in her present time, size and greatness." Bird's-eye-view of modern Jerusalem. The city is represented as it would be seen from the eastern heights of the Mount of Olives. From the oblique angle an incredible amount of detail can be seen as the viewer looks down into the circular walled city. But, as with all such views, the map is not drawn to scale. Trans. of Latin, from the Prophet Exekiel: "This is Jerusalem!I have set it in the midst of the nations and countries that are round about her." Peregrinationis Divi Pavli Typus Chorographicus. Copperplate 34.8 x 49.8 cm. Shows the entire Eastern Mediterranean from Italy as far as Mesopotamia as traveled through by St. Paul. On both sides of the title cartouche are medallions depicting scenes from the life of St. Paul. Ortelius (1527-1598) was the creator of the first modern atlas, Theatrum Orbis Terrarum (Theater of the World). The Theatrum is considered the first publication of a systematic collection of maps of the known world, which meets the modern definition of an atlas. Ortelius gathered the most accurate maps from other cartographers and carefully re-engraved their maps to match his own. Also, he was the first to acknowledge publicly his sources in the appendix. The maps were based on contemporary knowledge rather than theories or imagination. The contributions of Ortelius are such that he is considered one of the most influential persons in the history of modern geography and cartography. Terra Sancta a Petro Laicstain perlustrata, et ab eius ore et schedis a Christiano Schrot in tabulam redacta. Copperplate 36.5 x 50 cm. The Holy Land described by Petrus Laicstain and designed by Christian Schrot. Oriented to the east. Shows the shoreline from Beirut to Gaza. Many fanciful bays and promontories distort the shoreline. The wide meanderings of the River Jordan do not correspond to reality. Biblical vignettes surround the title cartouche.Left hand bottom, Jonah is being thrown from the ship to the whale. This map illustrated how the Holy Land would appear for one approaching by ship, which was the normal mode of travel by pilgrims. The entire map is enclosed in a border with a simple design that was made to resemble a picture frame. Abrahami Patriarchae peregrinatio et vita. Copperplate 35 x 45 cm. The wanderings and life of Abraham, the Patriarch. Shows Palestine and part of Egypt, from Dan to the Nile Delta. 22 medallions (vignettes) depicting Abraham's life, from his departure from Ur until his death, surround the map. A small inset shows a map of the Middle East from the Mediterranean to the Euphrates River. Situs Terrae Promissionis SS Bibliorum intelligentiam exacte aperiens: per Christianum Adrichomium Delphum. Copperplate 35.4 x 101 cm. Oriented to the east, this map shows the whole of Palestine divided into the 12 Tribes on both sides of the Jordan River, the shoreline running from Sidon to Alexandria. The River Cison (Kishon of today) is shown as connecting the Lake of Tiberias with the Mediterranean Sea. There are many nonexistent rivers, e.g., a river connecting Jerusalem with the Dead Sea. In the Dead Sea, four burning cities are shown: Sodoma, Gomorra, Seboim, and Adama. Published after Adrichom's death by Gerardus Brunius. The atlas (Theatrum Terrae Sanctae) is considered the first scientific book on historical geography of the Holy Land. Adrichom (1533-1585) was a Dutch priest whose scholarly research of the Bible and writings of pilgrims and Josephus made him the acknowledged expert on Holy Land geography. Josephus was a Jewish historian who was employed by the Romans to write about the history of Roman Palestine during the Jewish revolt of 60-70 AD. Many of his works contain accurate geographic details based on his firsthand observations. Adrichom was assigned to Cologne during the time it was a thriving center for cartography and atlas publishing. Copperplate 15 x 19 cm. 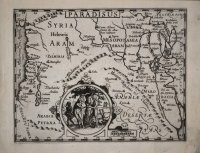 This map of the entire Middle East locates the site of Paradise near Babylon between four rivers. At center bottom is a vignette of Adam and Eve under the fruit tree. 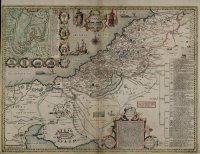 In 1604, the copperplates for Mercator's Atlas were sold to Hondius. The atlas was so popular that Hondius produced it in a smaller and cheaper format called Atlas Minor, of which he and his successors published 25 editions between 1607 and 1738. Gerhard Mercator (1512-1594) is one of the best-known cartographers in history. He was Flemish but moved to Germany after being accused of heresy. With his experience as a land surveyor and maker of astronomical and mathematical instruments, he developed a projection that is still widely used for navigational charts. 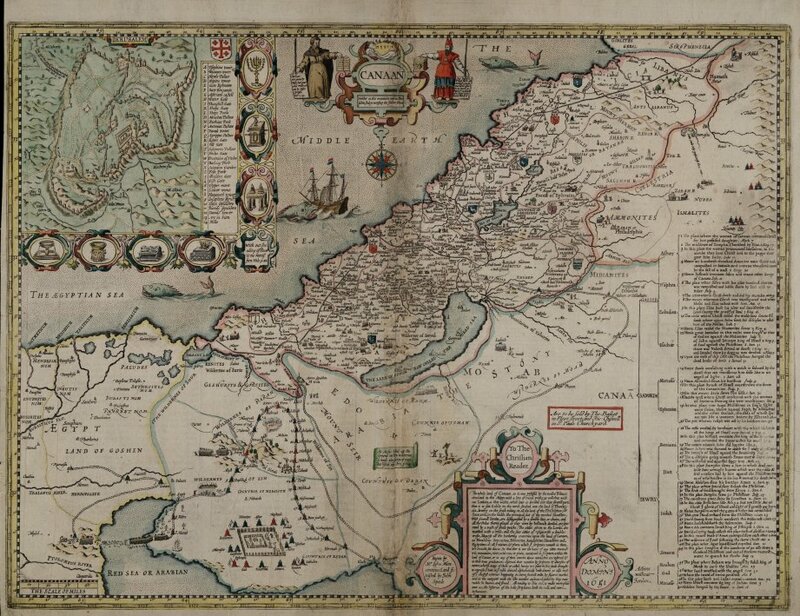 The first part of his celebrated Atlas was published in 1585. Tribus Zabulon, Isachar, et, Dimidia Manasse altera, hoc est, illae Terrae Sanctae regions, quas iste tribus in distribuendo possidendas acceperunt. Copperplate 37 x 40 cm. 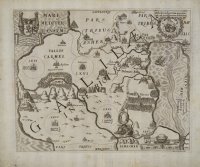 Oriented to the east, this map is the fourth of ten Tribal maps drawn by Adrichom for publication in his Theatrum Terrae Sanctae (The Theater of the Holy Land). No Connection to PALMM Blaeu, Willem Janszoon. 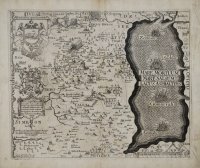 Terra Sancta quae in Sacris Terra Promissionis olim Palestina..
Copperplate 38 x 50 cm. "The Holy Land, Promised Land or Palestine." Relief shown pictorially. 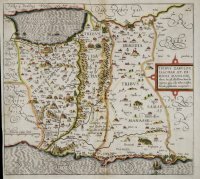 This map originally appears in the first edition of the Atlas of Willem Janszoon Blaeu in 1630, although the Library's copy has the date 1629. This map is from the French edition. The Holy Land and Sinai are depicted with adjacent parts of Syria and Egypt. 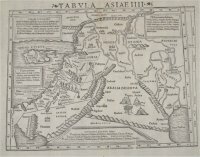 The coastline extends from the Nile Delta to Tripoli (Lebanon).The map has an unusual western orientation that lays out the Holy Land as it would have been seen by Moses from Mt. Pisgah at the end of his life, and places the Mediterranean coast at the top. The path of the Exodus through the desert is shown and there are numerous drawings on the map of events that occurred along the way (e.g., the Pharaoh's forces are shown drowning in the Red Sea). Other features of the map include several distortions of bodies of water and a depiction of all four cities destroyed for their wickedness (with Sodom and Gomorra shown in flames). Willem Blaeu (1571-1638) founded one of the most successful cartographic institutes and publishing houses of the seventeenth-century Netherlands. He and his sons published atlases, globes and maps for over four decades. His Atlas, published for over 34 years, culminated in a12-volume work with over 600 maps. It was among the most important geographical publications of the century. Palestina, siue Terrae sanctae descriptio. Copperplate 43.6 x 56.7 cm. Palestine or the Holy Land. Oriented to the east, divided into the Tribes on both sides of the Jordan River, the shoreline from Sidon to Alexandria.Along the top and the bottom 18 vignettes showing the Exodus. Bottom left of the map itself, a miniature inset view of Jerusalem. The cartouche has the decorative strap work and allegorical figure of a winged woman as part of the right edge. The entire map with surrounding vignettes is within a picture frame-type border. 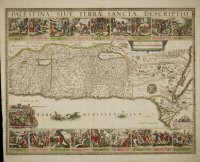 The map represents a transitional period in the production of Holy Land maps in that readers began to request more modern maps over historical ones. Jan Jansson's (1588-1664) name appears on the map, and he published it in Amsterdam.It is either a copy or a reprint of a map by Henricus Hondius drawn after Andrichom. The powerful family publishing firm of maps and atlases, Hondius-Jansson, began after Jansson married the daughter of Jodocus Hondius. His brother-in-law, Henricus Hondius, son of Jodocus, worked n a number of Mercator's plates and was the owner of them after Mercator's death. Paradise, or the gardens of Eden with the countries circumjacent inhabited by the patriarchs. Copperplate 31.5 x 46.5 cm. 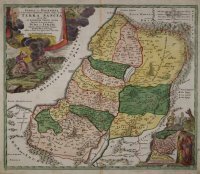 One of a series of six biblical maps published in Dutch by Visscher in 1671, which were completely translated into English by Moxon. The library's copy is from the second edition published in 1691. The cartouche in the upper right corner of the map depicts the expulsion of Adam and Eve from the Garden of Eden. The map is dedicated to the Duke of Buckingham, Chancellor of Cambridge. In the upper left corner is a colored copy of the Duke's Coat of Arms with the dedication signed by Joseph Moxon. Moxon (1627-1691) was a London cartographer, engraver, publisher and seller of maps and globes, and maker of navigational instruments. For a while he was a hydrographer to the king. Moxon was instrumental in breaking the stranglehold the Dutch had on making nautical charts. He translated them into English and had them printed in London. Copperplate 28.1 x 34.3 cm. Shows the inland territory west of the Dead Sea apportioned to the Tribe of Judah. In a big, impressive Dead Sea, four cities, including Sodom and Gomorrah, are burning. Biblical illustrations are on the map. The decorative scale has a child with map dividers. The emblem of the Tribe: a crouching lion. Thomas Fuller (1608-1661) was a respected English clergyman who wrote commercially successful books on history and geography of the Holy Land. His Pisgah-Sight of Palestine was a geographical description of the Holy Land with special reference to biblical history. For over two centuries it was considered the finest collection of maps and descriptions of the area. Pisgah-Sight appeared with 30 double-page copper plates, an expensive method of illustration. Fuller financed the book by dividing it into sections and finding sponsors for each one. This was a precursor to the practice of publishing by subscription.To acknowledge the patrons, all maps contained decorative cartouches with the sponsor's coat of arms and a dedication to him that was signed with the initials, "F.T." 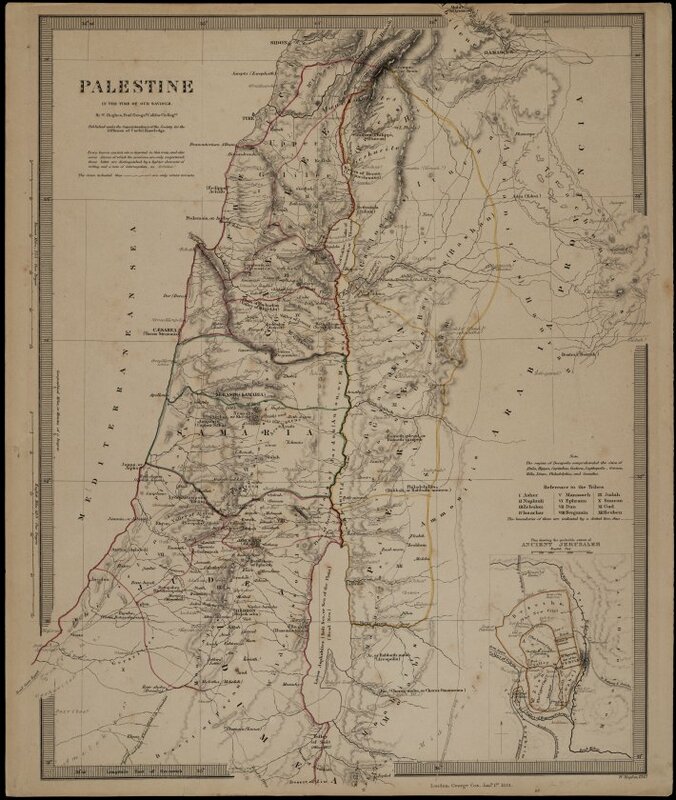 Smathers Libraries has a copy of Pisgah-Sight of Palestine and the majority of the map sections. Copperplate 27.4 x 34.3 cm. Shows the territory in "Galilaea inferior," apportioned to the Tribe of Zebulon.Many biblical illustrations are on the map. The decorative scale has a globe and map dividers.The emblem of the Tribe: a ship with mast. No Connection to PALMM Speed, John. Copperplate 37 x 51 cm. Shows part of Egypt, the Sinai Peninsula, and Palestine on both sides of the Jordan River, divided among the Tribes. The shoreline runs from "Biblus" as far as the Nile delta. Delineating the route of the Exodus. The emblems of the Tribes appear on the map. Biblical illustrations are scattered over the map–e.g., the encampment of the Tribes in the Desert around the Tabernacle. The title cartouche shows Moses and Aaron. Includes the inset of Jerusalem, a plan of the ancient city surrounded by vignettes showing the Temple vessels and index to locations of biblical events. John Speed (1552-1629) was an English historian and cartographer who had been trained in his father's trade of tailoring. However, he had both the passion and talent for mapmaking. 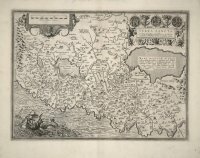 In 1611, he was responsible for the first printed "atlas of the British Isles, Theatre of the World of Great Britaine." It contained county maps with an innovative addition of insets of town plans similar to the one on this map. A Mapp of the travels and voyages of the Apostles in their mission and in particular of Saint Paul. Copperplate 30.8 x 46.2 cm. Shows the entire Eastern Mediterranean from Italy as far as Mesopotamia as traveled through by Paul. Small ships and dotted lines show the voyage of Paul from Jerusalem to Rome. The bottom third of the map contains large inset drawings of 13 apostles. The map contains a dedication to and shield of the Baronet who supported the making of the map. Richard Blome (1669-1705) was a Heraldic writer and cartographer who flourished in the latter half of the seventeenth-century. He was a prolific, but not at all an original, worker and was frequently accused of plagiarism although he made no attempt to hide his sources. His maps were attractive and quaintly designed and they still retain their charm. No connection to PALMM Homann, Johann Baptist. Iudaea seu Palaestina … hodie dicta Terra Sancta prout olim in Duodecim Tribus divisa separatis ab invicem Regnis Iuda et Israel… collecta ex Tabulis Guil. Sansonij… a Joh. Baptista Homanno. Copperplate 48.5 x 57 cm. 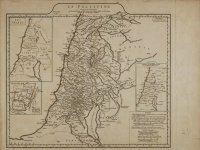 Map of Palestine divided among the Tribes, drawn by Homann after Guillaume Sanson. The shoreline runs from "Sidon" as far as "Rinocorura." The mythical Kishon River is shown as connecting the Mediterranean Sea with the Lake of Tiberias. The title cartouche at upper left shows Moses receiving the Tablets of the Law on Mount Sinai. At the bottom right corner appears a small inset map delineating the Exodus.Moses and Aaron (brother of Moses and the traditional founder of the Jewish priesthood) stand nearby. On the top of this map, two spies are carrying the oversized bunch of grapes (a visual reference from Exodus). Johann Baptist Homann (1663-1724) was a renowned mapmaker and atlas publisher in Nuremberg whose success helped revitalize German cartography in the eighteenth-century. The cartographic institute he founded in1702 was continued by his heirs well into the nineteenth-century. 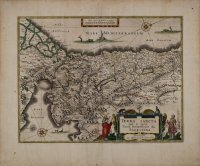 This map was published in his first atlas, Atlas Novus Terrarum (1702-1707). Copperplate 42 x 57.3 cm. Shows the entire Middle East from Crete to Babylonia, Phoenicia, Palestine, and Egypt. Palestine is divided among the 12 Tribes, shows the empire of David and Solomon with the route of the Israelites through the desert. Copperplate 38 x 43 cm. Relief shown pictorially. The map includes regional and tribal names but the Twelve Tribal divisions are drawn on the inset map. The Jordan River between the Lake of Tiberias and the Dead Sea is shown as a large bulge, whereas in fact it should be shown nearly as a straight line. Insets include: "Les Tribus;" and "Jerusalem" (a plan of ancient Jerusalem). Includes one diagram of eight scales and the distances between various places are given upon a reduced scale. Jean Baptiste Bourguignon d’Anville (1697-1782) is considered one of the greatest French geographers of the eighteenth-century. His maps are known for their elegance and scholarship. He was one of the first whose main object was to reform geography in drawing his maps with exactitude, in putting an end to the blind copying of older maps, and in eliminating the baroque fantasies illustrating such maps. He preferred scholarly research and scientific method in the development of his own maps. He produced over 200 maps and collected over 10,000 maps from others. No connection to PALMM. Rapkin, John. Modern Palestine. The Illustrations by H. Warren & Engraved by R. Baker. The Map Drawn & Engraved by J. Rapkin. Steel engraving 32.2 x 24.3 cm. Shows Syria and Palestine during the period of Turkish rule; illustrations of Jaffa, Gazelle, Nazareth and natives of Mount Lebanon. No connection to PALMM. Hughes, William. Steel engraving 39 x 32 cm. 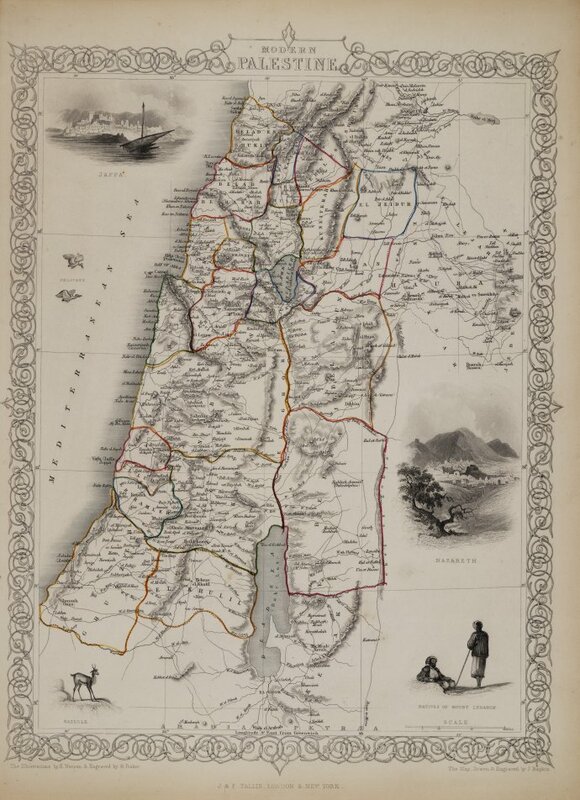 Shows locations of the tribes of Israel at the time of Christ; map drawn in 1842 but from edition of an atlas published in 1853. Inset: Plan showing the probable extent of ancient Jerusalem. Roman numerals keyed to the legend show Tribal territories. Relief shown by hachures. A fellow of the Royal Geographical Society, Hughes (1817-1876) was a professor of geography at the College of Civil Engineering. He was also a surveyor and engraver. 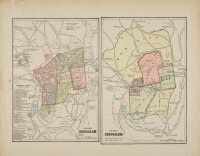 The Royal Geographical Society was responsible for issuing inexpensive publications, including its maps, that were quite popular and responsible for the development of a new form of literature readily available and enjoyed by a wide diversity of people. Hughes is responsible for maps published in a number of atlases in Edinburgh, London, and the United States. Birds-Eye-View of the Holy Land. Lithograph 25.5 x 30.2 cm. This oblique view of the Holy Land illustrates how much bird's-eye views have developed since the Nuremberg Chronicle’s view of Jerusalem.They have become more representative of the city's actual streets and buildings, although these types of maps are still not drawn to scale. The map also demonstrates the changing aesthetic of late nineteenth-century maps that increasingly had little decoration and emphasize scientific method and accuracy. Note the steamships in the Mediterranean in contrast to the sailing and fishing boats on earlier Holy Land maps. One fourth of the map is the eastern sky, containing numerous birds. 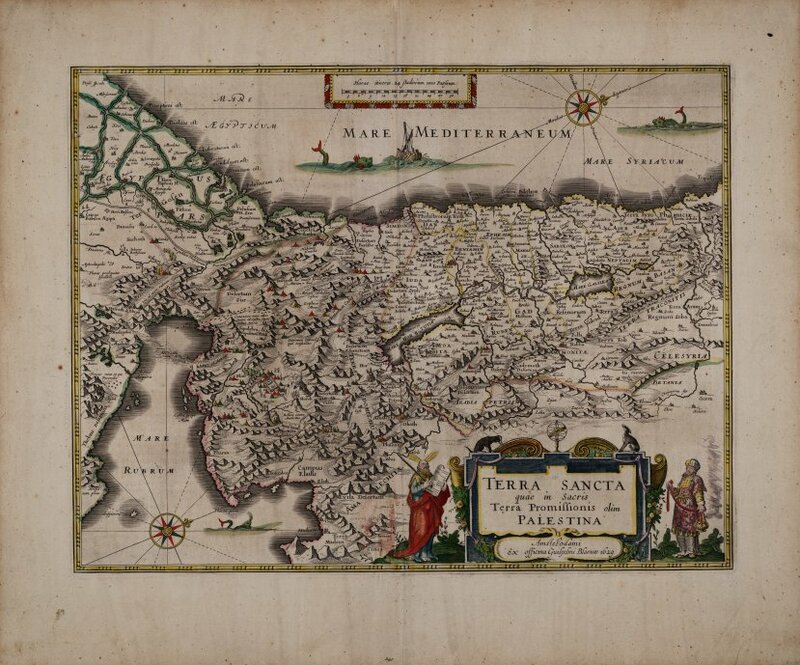 This map is printed with the map of Palestine and Japan on its verso and is from an atlas produced by the George F. Cram Publishing Company of Chicago. Beginning in 1883, there were many general atlases published by the company for use in schools and libraries. Steel engraving 29 x 37 cm. Page 61 of verso contains information from Interest Rates to Knit Goods, from the Statistical Dictionary. This map demonstrates further evidence of the late-nineteenth-century's tendency towards a more scientific, more rational approach to maps and cartography, even in the area of Holy Land maps. The exhibit, "Tracks to the Promised Land: Selected Maps of the Holy Land," signifies a productive collaboration among the exhibit team consisting of John Ingram (Director of Collections), Robert Singerman (Head, Price Library of Judaica), HelenJane Armstrong (Head, Map and Imagery Library), Jeffrey Barr (Curator of Rare Books), and Robert Shaddy (Chair, Special and Area Studies Collections). The following individuals also played a significant role in the exhibit and their efforts are acknowledged with thanks and appreciation: John Freund, Erich Kesse, Barbara Hood, Joe Aufmuth, Bill Hanssen, Russ Fairman, and Susan Lupi. We also acknowledge the generous support of the Howe Society. The focus of the exhibit is upon the maps and rightly so. They span the fifteenth- through nineteenth-centuries and trace mapmaking technologies and collaborations evident from the cradle of printing to the dawn of contemporary society and the digital age. Each map represents a concentrated production (among cartographer, engraver, publisher, patron, etc.) that, until the late nineteenth-century, stressed aesthetic and religious imagery over geographical accuracy. Viewers are encouraged to consult the interpretative labels and look closely at these remarkable works of art and craftsmanship. Subjects suggested by the maps on display (e.g., the history of mapmaking, the Holy Land in iconography, Biblical history, among many others) may be readily researched by consulting the University of Florida Libraries’ Catalog. We hope that this exhibit will stimulate interest in our collections among students, faculty, staff, and members of the community.